SAN FERNANDO VALLEY, CA – The holiday season can be heartbreaking for transgender, queer, and gender non-conforming youth due to family rejection, forced dress codes, the constant policing of their gender expression, lack of funds for a gift, the denial of their wishlist, and the uncertainty of knowing whether someone out there cares to give them extra support and love. In 2015, the 1st San Fernando Valley LGBTQ Youth Holiday Drive was established to provide clothing, books, blankets, and toys to local youth. We also decided to take on helping homeless and foster youth, who have experienced trauma from a very early age. This holiday season, let us come together to continue honoring the existence and resilience of LGBTQ+ youth in the San Fernando Valley. The 3rd annual LGBTQ Youth Holiday Drive needs your support. Help us in continuing to foster a local sense of kindness, participation, belonging, and transformation. Click on buttons below to become a gift sponsor for one of the LGBTQ+ youth participants or drop off a donation in one of our partner location below. 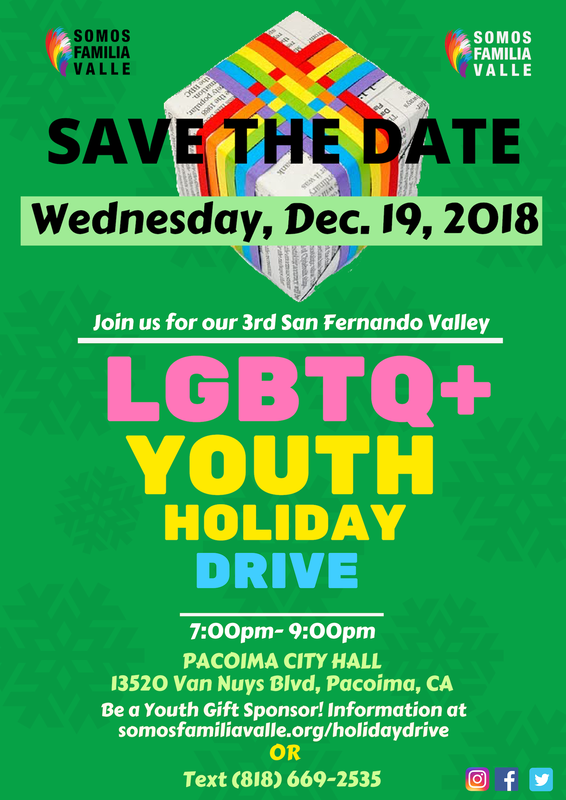 The 3rd LGBTQ Youth Holiday Drive in the San Fernando Valley will take place on Wednesday, DEC 19, 2018 @ 7 PM in at Pacoima City Hall : 13520 Van Nuys Blvd, Pacoima, CA 91331. **Special thanks to our community partners & donation drop off location for coming forward to support LGBTQ+ youth together. #SomosFamiliaValle We're a Valley Family!